Two postponements in four days have left in-form Harrogate Railway frustrated as they bid to climb the NCEL Premier Division standings. 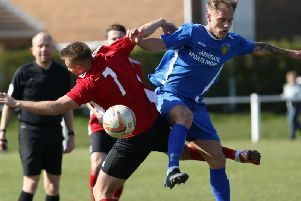 Paul Beesley’s men have been in fine fettle of late, winning four of their last five games, but last Saturday’s home clash with Hemsworth and Tuesday’s trip to Staveley both fell foul of the weather. “It’s a bit frustrating, and I just hope it doesn’t affect our form,” Beesley said. “When you’re playing well and winning you just want the games to keep coming thick and fast, so the two postponements came at a really bad time. The Locomotives currently sit 17th in the Premier Division table, but have a number of games in hand most of the sides above them. Their next scheduled clash sees them entertain 18th-placed Rainworth Miners Welfare at Station View on Saturday, 3pm kick-off. “We lost 3-0 to Rainworth in a midweek game back in October, and really we should have got something that night,” Beesley added. “With that in mind, we feel like we owe them one and want to put that result right on Saturday.